With the plethora of cars to come up for auction in Arizona in January, I probably should have started going through them months ago. 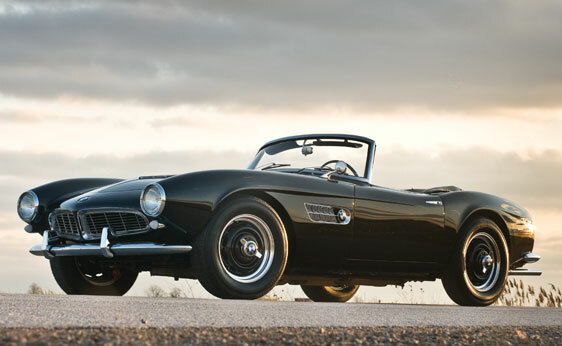 But they weren’t available months ago so I’m starting today and we’re going to start with this beautiful, somewhat Gothic-looking 1959 BMW 507 being offered by RM Auctions. It’s one of only 252 built – which is startlingly rare. It’s possibly the most beautiful BMW ever built. Black with black wheels – what a combo! The tan interior is a nice touch that will brighten your day if you are lucky enough to ever sit in this car. It is, without a doubt, the most stunning color-combo I’ve ever seen on a 507. It has been fully restored with a 3.2-liter (okay, 3168cc) V8 producing 150 horsepower through a 4-speed manual. It will hit speeds over 120 mph – which seems slow, but this car was produced in the 1950s (1956-1959). Plus, it looks like it’s doing half that standing still. The 507 almost bankrupted BMW – it’s planned price point was $5,000 USD at 5,000 units per year, but soaring production costs sent the price soaring as well, eventually reaching $10,500 – and BMW still lost money on each one built. Not many 507s have come up for auction in the past few years. RM sold two earlier this year for slightly over $1 million USD each and Gooding & Company sold one in 2009 for around $900,000. From the looks of it, this car will top all three. RM has not yet published auction estimates or a catalog description but you can find the car here and information on the sale here. This entry was posted in Uncategorized and tagged 1959, 507, Arizona, auction, auto, BMW, BMW 507, car, European, RM by classiccarweekly. Bookmark the permalink.